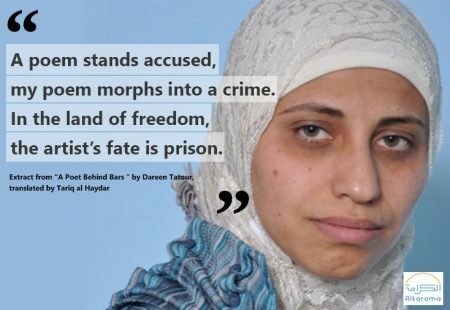 So read the words of a poem written by the young poet Dareen Tatour, who was put in prison under charges of ‘incitement’ in 2015 for a poem that she wrote that was posted on Youtube. She has now been in prison for more than two years, and was supposed to have a court hearing on December 27th, but it was postponed until January. Dareen’s case has drawn attention from poets and authors worldwide, for the implication it has on free speech. Several petitions submitted to the Israeli government have called for Dareen’s release, but the government continues to delay her trial on ‘incitement’ charges.